Social franchises are increasingly being used and recognised as a tool to quickly and effectively create sustainable impact. But their potential to support probation and reintegration of former prisoners has not yet been fully explored. We take a look at what social franchises, penal systems and sanitary towels have in common. “In several African countries like Zimbabwe, Chad, Ethiopia, Malawi, Mozambique, Nigeria and Uganda, these vulnerable individuals [women prisoners] do not have easy access to sanitary towels and must either depend on others to supply the basic need or improvise with cloths, newspapers, tissues, pieces of blanket or prison uniforms.” (Amnesty International). 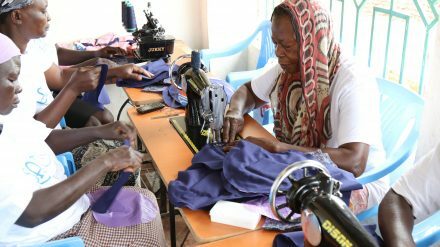 As identified by Penal Reform International (PRI), almost 70 per cent of the women interviewed in Kenya in 2016 as part of ‘Community service and probation for women: a study in Kenya’ said they had committed offences to earn money and support their families. Imagine doing everything you can to try and feed your family, and instead you have your freedom stripped away. Now your family has lost a provider and caregiver, and on top of that they must supply expensive sanitary towels for you while you are in prison. For most, this is simply not affordable. However, issues around menstruation and lack of access to sanitary products are not just unique to prison. A UNESCO report estimates that one in 10 girls in Sub-Saharan Africa misses school during their menstrual cycle. In too many communities across the world, menstruation is a taboo subject. There is often little to no advice available for girls and no access to affordable sanitary pads, forcing women and girls to use rags and, in some cases, leaves, which can result in disease. The stigma and lack of understanding results in girls feeling like they have to stay at home, missing out on as much as 25 per cent of their education or dropping out altogether. Is there something we could do to simultaneously provide solutions to both these issues – the lack of access to sanitary towels in prisons, and the lack of menstruation education in the community? This is where Petal, a social franchise of sanitary towel micro-enterprises, could come in; and, together with PRI, we are looking into piloting a first project benefiting women probationers (funding permitting). The Petal franchise establishes small businesses owned by a group of people in the community, which makes and sells the sanitary towels at as low as 10 per cent of the cost of commercial alternatives. Alongside supplying sanitary towels, the entrepreneurs deliver free education on menstruation to everyone in their community, including men and boys, ultimately creating a universal understanding of a natural process. Each micro-enterprise provides full-time employment to local women, whilst combining the necessity of a menstrual solution with the sustainability of a commercial business. So how does a Petal business fit into the penal system? Fortunately, not all women who are convicted of a crime are incarcerated; some receive community service or are placed on some form of probation. However, whether it is probation or imprisonment, there is often little to no training or up-skilling, meaning women can get stuck in a damaging cycle. Setting up a Petal business as an empowerment project during the probation period would not only give women skills in tailoring, marketing, sales and education, but would also allow them to make significant contributions to their community. This social service will show communities that these women can add value, breaking down some social stigmas. It will also show the women that they are capable of so much more and give them the confidence that society hasn’t given up on them. The beauty of this is that there is an opportunity to create a circular solution. Petal businesses can create an affordable supply of sanitary towels for the incarcerated women forgotten by the system, who are otherwise left to use improvised and unhygienic alternatives. Ultimately, this supports women who are on probation to break out of the cycle of poverty, increasing their value as seen by the community, and provides a basic human right to incarcerated women – all through sustainable business. One of the most exciting aspects of this is that the platform to scale already exists. Working via the probation services would allow for the central training of probation staff to start Petal businesses. The nationwide distribution of the probation service would then create a nationwide supply of sanitary towels! Read PRI’s study on Community service and probation for women. Main image: a Petal business in Lira, Uganda. Adam Boxer is a Director of Wessex Social Ventures, a social enterprise that gives international development charities the opportunity to use trade to produce greater, more sustainable impact than using aid programmes alone.